As human actions change the planet in irreversable ways, will human bonds suffer irreversable damage, too? 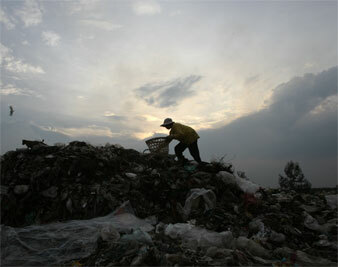 Reuters Pictures A man ekes out a living scavenging on a garbage dump in the Philippines. This February, while cranes were hoisting cladding to the 141st floor of the Burj Dubai tower (which will soon be twice the height of the Empire State Building), the Stratigraphy Commission of the Geological Society of London was adding the newest and highest story to the geological column. The Geological Society of London is the world’s oldest association of Earth scientists, founded in 1807, and its Commission acts as a college of cardinals in the adjudication of the geological time-scale. Stratigraphers slice up Earth’s history as preserved in sedimentary strata into hierarchies of eons, eras, periods and epochs marked by the “golden spikes” of mass extinctions, speciation events and abrupt changes in atmospheric chemistry. In geology, as in biology or history, periodization is a complex, controversial art and the most bitter feud in nineteenth-century British science–still known as the “Great Devonian Controversy”–was fought over competing interpretations of homely Welsh Graywackes and English Old Red Sandstone. More recently, geologists have feuded over how to stratigraphically demarcate ice-age oscillations over the last 2.8 million years. Some have never accepted that the most recent inter-glacial warm interval–the Holocene–should be distinguished as an “epoch” in its own right just because it encompasses the history of civilization. As a result, contemporary stratigraphers have set extraordinarily rigorous standards for the beatification of any new geological divisions. Although the idea of the “Anthropocene”–an Earth epoch defined by the emergence of urban-industrial society as a geological force–has been long debated, stratigraphers have refused to acknowledge compelling evidence for its advent. At least for the Geological Society of London, that position has now been revised. To the question “Are we now living in the Anthropocene?” the twenty-one members of the Commission unanimously answer “yes.” They adduce robust evidence that the Holocene epoch-the interglacial span of unusually stable climate that has allowed the rapid evolution of agriculture and urban civilization–has ended and that the Earth has entered “a stratigraphic interval without close parallel in the last several million years.” In addition to the buildup of greenhouse gases, the stratigraphers cite human landscape transformation which “now exceeds [annual] natural sediment production by an order of magnitude,” the ominous acidification of the oceans, and the relentless destruction of biota. This new age, they explain, is defined both by the heating trend (whose closest analogue may be the catastrophe known as the Paleocene Eocene Thermal Maximum, 56 million years ago) and by the radical instability expected of future environments. In somber prose, they warn that “the combination of extinctions, global species migrations and the widespread replacement of natural vegetation with agricultural monocultures is producing a distinctive contemporary biostratigraphic signal. These effects are permanent, as future evolution will take place from surviving (and frequently anthropogenically relocated) stocks.” Evolution itself, in other words, has been forced into a new trajectory. The Commission’s coronation of the Anthropocene coincides with growing scientific controversy over the 4th Assessment Report issued last year by the Intergovernmental Panel on Climate Change (IPCC). The IPCC is mandated to establish scientific baselines for international efforts to mitigate global warming, but some of the most prominent researchers in the field are now challenging its reference scenarios as overly optimistic, even pie-in-the-sky thinking. The current scenarios were adopted by the IPCC in 2000 to model future global emissions based on different “storylines” about population growth as well as technological and economic development. Some of the Panel’s major scenarios are well known to policymakers and greenhouse activists, but few outside the research community have actually read or understood the fine print, particularly the IPCC’s confidence that greater energy efficiency will be an “automatic” byproduct of future economic development. Indeed all the scenarios, even the “business as usual” variants, assume that at least 60 percent of future carbon reduction will occur independently of greenhouse mitigation measures. The Panel, in effect, has bet the ranch, or rather the planet, on unplanned, market-driven progress toward a post-carbon world economy, a transition that implicitly requires wealth generated from higher energy prices ultimately finding its way to new technologies and renewable energy. (The International Energy Agency recently estimated that it would cost $45 trillion to halve greenhouse gas emissions by 2050.) Kyoto-type accords and carbon markets are designed–almost as an analogue to Keynesian “pump-priming”–to bridge the shortfall between spontaneous decarbonization and the emissions targets required by each scenario. Serendipitously, this reduces the costs of mitigating global warming to levels that align with what seems, at least theoretically, to be politically possible, as expounded in the British Stern Review on the Economics of Climate Change of 2006 and other such reports. Critics argue, however, that this represents a heroic leap of faith that radically understates the economic costs, technological hurdles, and social changes required to tame the growth of greenhouse gases. European carbon emissions, for example, are still rising (dramatically in some sectors) despite the European Union’s much-praised adoption of a cap-and-trade system in 2005. Likewise there has been little evidence in recent years of the automatic progress in energy efficiency that is the sine qua non of the IPCC scenarios. Although The Economist characteristically begs to differ, most energy researchers believe that, since 2000, energy intensity has actually risen; that is, global carbon dioxide emissions have kept pace with, or even grown marginally faster than, energy use. Coal production, especially, is undergoing a dramatic renaissance, as the nineteenth century has returned to haunt the twenty-first century. Hundreds of thousands of miners are now working under conditions that would have appalled Charles Dickens, extracting the dirty mineral that allows China to open two new coal-fueled power stations every week. Meanwhile, the total consumption of fossil fuels is predicted to increase at least 55 percent over the next generation, with international oil exports doubling in volume. Moreover there are disturbing signs that energy companies and utilities are reneging on their public commitments to the development of carbon-capture and alternative energy technologies. The Bush Administration’s “marquee demonstration project,” FutureGen, was scrapped this year after the coal industry refused to pay its share of the public-private “partnership”; similarly, most US private-sector carbon-sequestration initiatives have recently been cancelled. In the United Kingdom, meanwhile, Shell has just pulled out of the world’s largest wind-energy project, the London Array. Despite heroic levels of advertising, energy corporations, like pharmaceutical companies, prefer to overgraze the commons, while letting taxes, not profits, pay for whatever urgent, long-overdue research is actually undertaken. Dubai, which has little oil income of its own, has become the regional financial hub for this vast pool of wealth, with ambitions to eventually compete with Wall Street and the City of London. During the first oil shock in the 1970s, much of OPEC’s surplus was recycled through military purchases in the United States and Europe, or parked in foreign banks to become the “subprime” loans that eventually devastated Latin America. In the wake of the attacks of 9/11, the Gulf states became far more cautious about entrusting their wealth to countries, like the United States, governed by religious fanatics. This time around, they are using “sovereign wealth funds” to achieve a more active ownership in foreign financial institutions, while investing fabulous amounts of oil revenue to transform Arabia’s sands into hyperbolic cities, shopping paradises, and private islands for British rock stars and Russian gangsters. Two years ago, when oil prices were less than half of the current level, The Financial Times estimated that planned new construction in Saudi Arabia and the emirates already exceeded $1 trillion dollars. Today, it may be closer to $1.5 trillion, considerably more than the total value of world trade in agricultural products. Most of the Gulf city-states are building hallucinatory skylines–and, among them, Dubai is the unquestionable superstar. In a little more than a decade, it has erected 500 skyscrapers, and currently leases one-quarter of all the high-rise cranes in the world. This super-charged Gulf boom, which celebrity architect Rem Koolhaas claims is “reconfiguring the world,” has led Dubai developers to proclaim the advent of a “supreme lifestyle” represented by seven-star hotels, private islands, and J-class yachts. Not surprisingly, then, the United Arab Emirates and its neighbors have the biggest per capita ecological footprints on the planet. Meanwhile, the rightful owners of Arab oil wealth, the masses crammed into the angry tenements of Baghdad, Cairo, Amman, and Khartoum, have little more to show for it than a trickle-down of oil-field jobs and Saudi-subsidized madrassas. While guests enjoy the $5,000 per night rooms in Burj Al-Arab, Dubai’s celebrated sail-shaped hotel, working-class Cairenes riot in the streets over the unaffordable price of bread. 4. Can Markets Enfranchise the Poor? Emissions optimists, of course, will smile at all the gloom-and-doom and evoke the coming miracle of carbon trading. What they discount is the real possibility that a sprawling carbon-offset market may emerge, just as predicted, yet produce only minimal improvement in the global carbon balance sheet, as long as there is no mechanism for enforcing real net reductions in fossil fuel use. In popular discussions of emissions-rights trading systems, it is common to mistake the smokestacks for the trees. For example, the wealthy oil enclave of Abu Dhabi (like Dubai, a partner in the United Arab Emirates) brags that it has planted more than 130 million trees–each of which does its duty in absorbing carbon dioxide from the atmosphere. However, this artificial forest in the desert also consumes huge quantities of irrigation water produced, or recycled, from expensive desalination plants. The trees may allow Sheik Khalifa bin Zayed to wear a halo at international meetings, but the rude fact is that they are an energy-intensive beauty strip, like most of so-called green capitalism. And, while we’re at it, let’s just ask: What if the buying and selling of carbon credits and pollution offsets fails to turn down the thermostat? What exactly will motivate governments and global industries then to join hands in a crusade to reduce emissions through regulation and taxation? Kyoto-type climate diplomacy assumes that all the major actors, once they have accepted the science in the IPCC reports, will recognize an overriding common interest in gaining control over the runaway greenhouse effect. But global warming is not War of the Worlds, where invading Martians are dedicated to annihilating all of humanity without distinction. Climate change, instead, will initially produce dramatically unequal impacts across regions and social classes. It will reinforce, not diminish, geopolitical inequality and conflict. As the United Nations Development Program emphasized in its report last year, global warming is above all a threat to the poor and the unborn, the “two constituencies with little or no political voice.” Coordinated global action on their behalf thus presupposes either their revolutionary empowerment (a scenario not considered by the IPCC) or the transmutation of the self-interest of rich countries and classes into an enlightened “solidarity” without precedent in history. From a rational-actor perspective, the latter outcome only seems realistic if it can be shown that privileged groups possess no preferential “exit” option, that internationalist public opinion drives policy-making in key countries, and that greenhouse gas mitigation could be achieved without major sacrifices in upscale Northern Hemispheric standards of living–none of which seems highly likely. And what if growing environmental and social turbulence, instead of galvanizing heroic innovation and international cooperation, simply drive elite publics into even more frenzied attempts to wall themselves off from the rest of humanity? Global mitigation, in this unexplored but not improbable scenario, would be tacitly abandoned (as, to some extent, it already has been) in favor of accelerated investment in selective adaptation for Earth’s first-class passengers. We’re talking here of the prospect of creating green and gated oases of permanent affluence on an otherwise stricken planet. Of course, there will still be treaties, carbon credits, famine relief, humanitarian acrobatics, and perhaps the full-scale conversion of some European cities and small countries to alternative energy. But the shift to low-, or zero-emission lifestyles would be almost unimaginably expensive. (In Britain, it currently costs $200,000 more to build a zero-carbon, “level 6” eco-home than a standard unit of the same area.) And this will certainly become even more unimaginable after perhaps 2030, when the convergent impacts of climate change, peak oil, peak water, and an additional 1.5 billion people on the planet may begin to seriously throttle growth. The real question is this: Will rich counties ever mobilize the political will and economic resources to actually achieve IPCC targets or, for that matter, to help poorer countries adapt to the inevitable, already “committed” quotient of warming now working its way toward us through the slow circulation of the world ocean? To be more vivid: Will the electorates of the wealthy nations shed their current bigotry and walled borders to admit refugees from predicted epicenters of drought and desertification like the Maghreb, Mexico, Ethiopia, and Pakistan? Will Americans, the most miserly people when measured by per capita foreign aid, be willing to tax themselves to help relocate the millions likely to be flooded out of densely settled, mega-delta regions like Bangladesh? Market-oriented optimists, once again, will point to carbon offset programs like the Clean Development Mechanism which, they claim, will allow green capital to flow to the Third World. Most of the Third World, however, probably prefers for the First World to acknowledge the environmental mess it has created and take responsibility for cleaning it up. They rightly rail against the notion that the greatest burden of adjustment to the Anthropocene epoch should fall on those who have contributed least to carbon emissions and drawn the slightest benefits from 200 years of industrialization. In a sobering study recently published in the Proceedings of the [US] National Academy of Science, a research team has attempted to calculate the environmental costs of economic globalization since 1961 as expressed in deforestation, climate change, over-fishing, ozone depletion, mangrove conversion and agricultural expansion. After making adjustments for relative cost burdens, they found that the richest countries, by their activities, had generated 42 percent of environmental degradation across the world, while shouldering only 3 percent of the resulting costs. The radicals of the South will rightly point to another debt as well. For thirty years, cities in the developing world have grown at breakneck speed without any equivalent public investment in infrastructure services, housing, or public health. In large part this has been the result of foreign debts contracted by dictators, payments enforced by the International Monetary Fund and public sectors wrecked by the World Bank’s “structural adjustment” agreements. This planetary deficit of opportunity and social justice is captured in the fact that more than one billion people, according to UN-Habitat, currently live in slums and that their number is expected to double by 2030. An equal number, or more, forage in the so-called informal sector (a first-world euphemism for mass unemployment). Sheer demographic momentum, meanwhile, will increase the world’s urban population by 3 billion people over the next forty years (9 percent of them in poor cities), and no one–absolutely no one–has a clue how a planet of slums, with growing food and energy crises, will accommodate their biological survival, much less their inevitable aspirations to basic happiness and dignity. If this seems unduly apocalyptic, consider that most climate models project impacts that will uncannily reinforce the present geography of inequality. One of the pioneer analysts of the economics of global warming, Petersen Institute fellow William R. Cline, recently published a country-by-country study of the likely effects of climate change on agriculture by the later decades of this century. Even in the most optimistic simulations, the agricultural systems of Pakistan (a 20 percent decrease from current farm output predicted) and Northwestern India (a 30 percent decrease) are likely to be devastated, along with much of the Middle East, the Maghreb, the Sahel belt, Southern Africa, the Caribbean and Mexico. Twenty-nine developing countries will lose 20 percent or more of their current farm output to global warming, while agriculture in the already rich north is likely to receive, on average, an 8 percent boost.